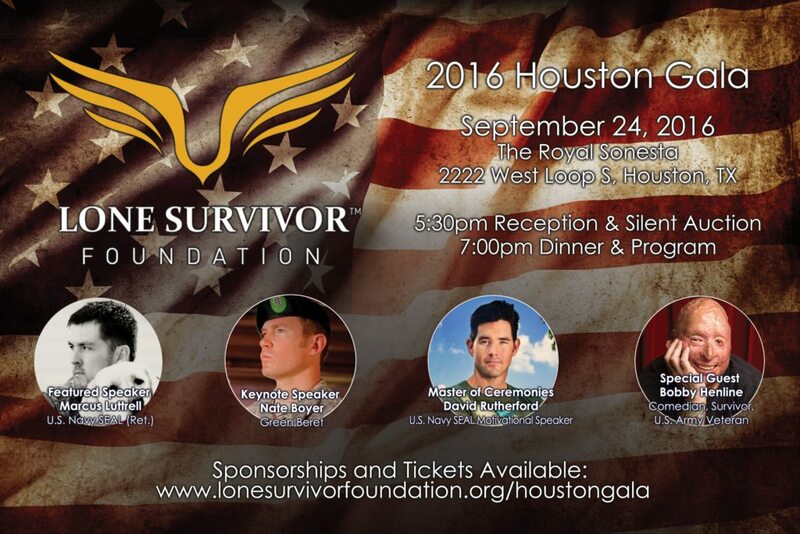 See Marcus Luttrell live in Houston, September 24th! “Lone Survivor” Marcus Luttrell delivered an emotional and hard-hitting speech last night at the Republican National Convention. Join Marcus in stepping up to make a difference at the Lone Survivor Foundation Houston Gala on Saturday, September 24, 2016 at the Royal Sonesta Hotel. Featuring Marcus Luttrell (U.S. Navy SEAL, Ret. ); Keynote Speaker, Nate Boyer (U.S. Army Green Beret, Ret. ); Comedian, Bobby Henline (U.S. Army Veteran, Ret. ); Motivational Speaker, David Rutherford (U.S. Navy SEAL, Ret. ); a panel of retreat attendees; and musical entertainment from Scott Brown (Scooter Brown Band) and Adam Martin (Blackbird Anthem), this event will be a night to remember!